Readying for a record release in July, Dirty Projectors is taking to the road to spread the sounds of the forthcoming Lamp Lit Prose (out July 13 on Domino). "Break-Thru," the recent single, is a cavalcade of the expected unexpected. Never dull, that's the one constant in the world of Dirty Projectors. 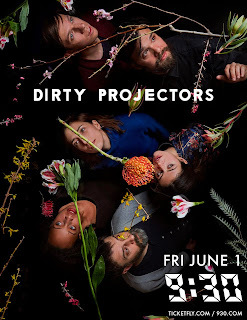 The pre-release tour just so happens to be stopping in this neck of the woods on Friday, June 1, and if you're going to see Dirty Projectors anywhere in town the 9:30 Club is the ideal landing spot. I've got a pair of tickets that you might find yourself winning. To win 'em, email me and tell me what your favorite Dirty Projectors record is, and just what it is that you love so much about it. If you just want to go ahead and snap up your tickets (always a wise idea), click here. FINE PRINT: Contest is for two (2) tickets to this here show. Contest closes at noon Eastern on Wednesday, 5/30/18. Good luck!